I made this photo album from recycled denim a few years back with a group of teenagers and it was a huge success. Choose the album or journal that you’d like to use first and then choose a pair of blue jeans that will fit. To determine if your jeans will fit, wrap the waist around the top of the album (back of jeans only) and be sure that the waist extends from each end with a few inches extra (refer to photo at right) This project is not a complicated one but requires a little patience. If you can, remove the insert of the album, if not you can work around it. Because denim is so heavy and the seams are very bulky, I first covered the album with demin used from the leg of the pants. To do this, place your album open with the outside face down on a denim leg. Cut a piece of denim that will cover the entire outside of the book and extend slightly into the inside cover. Keep the leg seam at the centre of your book as the seam is too bulky to be place elsewhere. With tacky glue (don’t use hot glue, it doesn’t hold up well and leaves streaks under the fabric), adhere your cut piece of demin to outside cover and glue excess over all the edges. 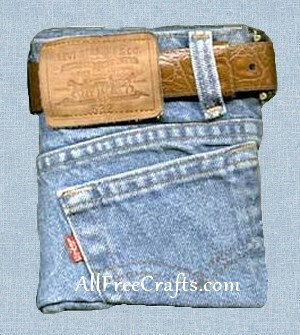 To hold the denim in place until it dries, secure with clothes pegs or clamps around the album. Allow the glue to dry completely. Position your book (open, with right side of book to wrong side of denim) around the back waist of the jeans, with a pen or marker, draw a line around the book leaving 1/2 inch excess to be folded to the underside at the top and the bottom of the book and 1 inch excess at the sides to be folded to the inside covers. Cut your piece and glue to the front and back outside covers, Folding the bottom excess denim under itself and the excess denim at the sides to the inside of the cover (see photo, at right, above, showing the back of the journal where, just below the pocket area, there is a folded under seam). Secure denim with clothes pegs and allow to dry. If you removed your insert, glue it back in place now. If you were not able to remove the insert, cut two pieces of fabric or paper to fit the inside cover of the front and back and glue in place to cover any turned seams. To finish the edging around the inside cover I added a trim of rusty red ribbon (similar in colour to the levis tag on the pocket), which you can see in the photo of the open journal, near right. Feed your belt through the belt loops and cut any excess belt off. I used a child’s belt so didn’t have to add any holes for the belt to connect. If you need to add holes, use either a leather punch or cut very carefully with a craft knife. To finish up this album, I added a purchased tag to the back pocket (Made with T.L.C.). You can add any extra embellishments now with tacky glue. Once the glue on your book is completely dry it will be a little stiff. That’s just the glue and a few little wiggles while the book is open will help to stretch the glue a little and make your book more pliable. Close the book, secure with the belt and you’re all done!